Sunny after a good rain yesterday! Hope your day goes well for you! And a couple more . . .
Not sure if this is the place to ask, but why can’t I get the JigSaw Puzzles to show on my iPad? I hope an iPad user can tell her! Karen, to ask a question, post a comment on Easy, not on your own page. Great ferry photo. Looks like a fun ride too! Kate. all. I agree jacalmi. It's a great photo. Wish we'd been able to take it when we were in Melbourne. Morning all,had a fun trip on that boat when we went to Tassie. Our car and caravan was first off when we arrived and with the three to four meter swell our car was covered in salt. One of the crew gave us directions to the show ground where we could hose it off. Despite all that rain, the humidity is still 93%. Instead of clearing the air, the rain seems to have contributed to the unpleasant stickiness. I've been taking walks around the neighborhood when I go to get the mail (instead of just elevator down and up) but today I will not step outside. I opened my balcony door and determined there was insufficient air in the air out there. Those cars are near the airport. I am surprised to hear planes still coming and going. I guess the runways have been better designed for drainage. Oh, now there are newer videos above the one I described, showing rescues by boat. The highway now looks like a tributary of the Potomac River. I am so glad, once again, that I live at the top of hills in three directions. Just after the nick of time. Thankfully our rain broke our heat/humidity, Sarah - it was such a delight that when it erupted I just continued doing yard work throughout the entire drenching storm; it has helped our golden brush-cut lawn immensely. But the reality is that we need much, much more! Meg, have a great day. 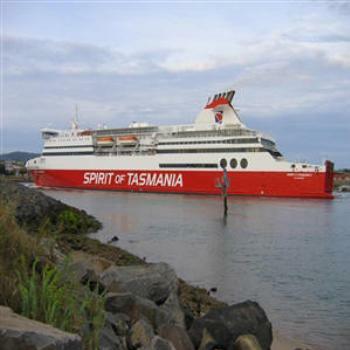 1:53 I went on the Spirit of Tasmania years ago. In the last 2 hours, we've had 4.25 inches (11 cm) of rain. And it's still sprinkling. got this afternoon but it was a lot. Won't have to water for a week or maybe more. Went to dinner, then to my nieces for Birthday cake. Wow - Hal - that's a whooooole lot of water; did it cause any disasters for you or others nearby? Good evening, Sue - it's been a while...…..! Nice to have you drop in! Thanks for the birthday wishes.... I'm off to lunch with my mother ( she's 94) and it's her shout (not literally). Then I have a coffee date later this afternoon with my SIL and probably MIL as well. Hubby has mentioned going to the Pub for tea. I will be well fed today! Wow, Hal, you guys really got a lot of rain! 'Just' 2.63 inches of rain fell in 42 minutes at Reagan National Airport and that managed to turn the road that goes by the airport into a deep river. Good maeN, good people. Skye just enjoyed her last day out with her friends in Norway. Tonight's her last night at her host home. Tomorrow they drop her off the the rendezvous of all the 4-H delegates from the US. They will count noses, debrief, sleep their last night in Norway at the hostel then head to the airport Thursday morning to head back to Newark, NJ. Skye sent me a selfie today with the Royal Palace in the background. She assured me that the King is at home. Karen from Talkeetna. I don't have an iPad but I know it's because the puzzles require Adobe Flash for them to work and Adobe Flash doesn't run on Apple phones and tablets. I have to do the jigsaws on a laptop or desktop. I wonder if Peter is the Captain of that ferry? He seems the living embodiment of The Spirit of Tasmania.